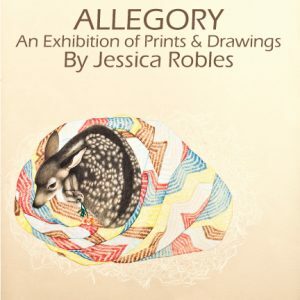 Allegories is an exhibition by College of the Sequoias art instructor and gallery director Jessica Robles. A Visalia native, Robles studied at College of the Sequoias before transferring to the Kansas City Art Institute. She then received her Master of Fine Arts degree from Northern Illinois University and joined the COS art department this past fall. Robles’ work is rooted in drawing and the draftsmanship she displays in these works is impressive. The traditional method of stone lithography is the primary medium in these images, many with hand-colored additions. They are quiet images, with delicately rendered forms framed by the stark white background of the paper surface. In all, there are three major groups of images in the exhibition. There is a series of lithographs of shoes which serve as metaphorical portraits of the wearers. These are the earliest works and date back approximately two years. A second series of hand-colored lithographs feature small objects, birds and other small animals as the subjects of rather mysterious stories, seemingly distant memories or dreamlike reflections. A final, small series of graphite drawings are exquisite variations on the animal subjects and personal metaphors interspersed in the second group of lithographs. Present in the images are hints of tenderness and sad reflection, as well as a subtle sense of humor. Robles states, “Our memories deteriorate or tarnish as we age and begin to develop holes in them. By creating these works, I hope to mend those holes and to attempt to breathe some life into them.” Suggesting a sense of nostalgia or sentimentality while not creating an overly saccharin image is a challenging goal for an artist, one that Robles handles deftly in these works. To view more of Jessica Robles’ work, visit www.jessicarobles.com.